Toyota Motorsports Group announced their entry into the Pikes Peak Hill Climb, the EV P002, an electric race car, that's a successor to last years EV P001 which set the electric car lap speed record at the Nürburgring. The last few years at the Pikes Peak Hill Climb has seen a growing presence of electric racing vehicles at this 90 year old racing event. Toyota Motorsport Group is rising to the challenge with the TMG EV P002, a new iteration of the TMG EV P001 which last year set a lap speed record for electric cars at the Nürburgring track in Germany. The EV P002 is built on a Radical race car chassis (perhaps the SR8) and features a massive electric drive train designed by Toyota Motorsports. TMG predicts a top speed of 150 miles/hr, in the Pikes Peak configuration. It's powered by a pair of axial flux electric motors with a top output of 350 kilowatts (approx 470 horsepower), a maximum torque of 900 Nm. Each of the motors has its own AC inverter, custom designed by TMG. The EV P002 has no transmission, like many electric vehicles a single gear reduction is adequate for the job, and would only introduce a loss in power. Topping it off is a massive 42 kilowatt-hour battery pack (for reference, the Nissan Leaf has a 24 kilowatt-hour pack) coupled with an offboard DC charging system. TMG notes that an electric car is perfect for the Pikes Peak Hill Climb. That race begins at 9,390 feet and finishes at the 14,110 foot summit of Pikes Peak, on a 12.42 mile course with 156 turns. PPIHC organizers say that as a racer climbs the mountain, the air thins of course, making it hard for a gas engine to maintain power because of lack of oxygen (not to mention the effect on the racers). Because an electric drive train doesn't rely on combustion, it doesn't care what the atmospheric pressure is. An electric race vehicle will continue performing just as strongly in a vacuum as it does at sea level. Last years car, the EV P001, used a pair of EVO Electric motors, giving a maximum output of 280 kilowatts, making the EV P002 a significant jump in power to 350 kilowatts. With that car they set a lap record of 7 mins 47.794 secs, over a 20.8 kilometers (12.92 miles) distance on the Nürburgring, beating the previous electric car lap record of 9 mins 1.338 secs, by a large margin. Toyota does not specify whose the axial flux motors are used in the EV P002, but a picture released by TMG contains gizmos which look suspiciously like EVO's motor design. TMG is a motorsports development company, and their website describes the services they can offer to motorsports teams. Electric racing is becoming a reality, in part due to electric motorcycle racing in the TTXGP series and the TT ZERO which ran yesterday on the Isle of Man. Additionally, there are also multiple efforts to establish electric car racing series. Many are talking about how electric vehicles are the future of racing. 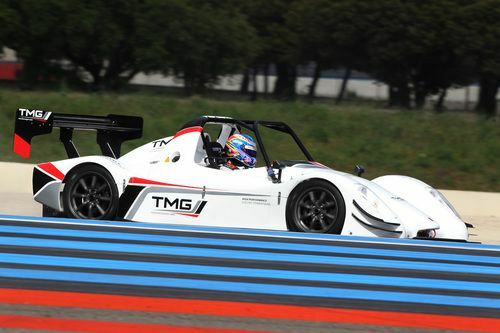 Last year TMG's statement on the EV P001 lap record at the Nürburgring included a statement that the event demonstrated TMG's electric drive train technology was "ideal to power any future single-make electric motorsport series." This a broad hint to the electric race car series organizers, that if one of them were to design their series around a spec class, that TMG was ready to supply components for that spec class. TMG is clearly looking to get into the business of supplying electric drive trains to racing teams.